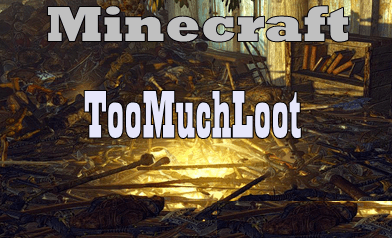 TooMuchLoot Mod enables you to define new loot that should spawn, whose concept and implementation is simple. When the mod first runs (and any time after, to keep things updated) a list is compiled of all the dungeon loot registered. A simple config file is then generated which lists all these items, as well as where they spawn. You can then toggle whether or not any of these items spawn at your leisure. The concept and implementation is simple. When the mod first runs (and any time after, to keep things updated) a list is compiled of all the dungeon loot registered. A simple config file is then generated which lists all these items, as well as where they spawn. You can then toggle whether or not any of these items spawn at your leisure. The config file in question can be found in the standard config folder, under “TooMuchLoot/MainConfig.cfg“. At the moment, this implementation is quite simple, but the ability to have more fine grained control over dungeon loot is in the works.